And I subscribe to that logic, loosely. If you don’t set down what it is you want to achieve, how will you know when you get there? There’s a whole raft of science out there that says goals = achievements. It helps keep us on track, focused and motivated. All that is great. Way better to have a plan and a set of goals than a dream and no action. But in recent times I’ve begun to think about things slightly differently. I’m going to put a case forward for the use of intentions rather than goals. And yes, it’s about more than just semantics. Goals are all about seeing into the future. They’re about understanding what the want, and how we are going to make that happen. As I’ve said they create the structure and process for the plan. For them to work well, or at all actually, they need to be fairly narrow and specific. I’m sure you’ve heard about SMART goals. 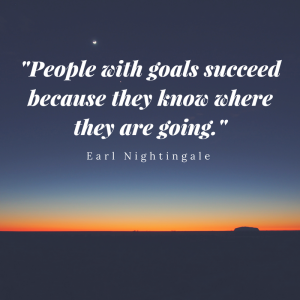 There’s a sense of achieve or fail about goals. And the big thing for me about goals is that they focus on the future outcome, leaving no scope for how to respond when real-life happens. Intentions on the other hand are a kind of holistic statement about what success in any situation might look, feel, act like. They help you live in the moment and respond to situations as they evolve, but critically intentions always pull you back to your core values (see last week’s blog). A good intention statement gives us guidance on how to react to what IS – including resetting or adjusting our goals if necessary. Intentions are also a little bit clever with your brain as they trigger responses from both the right and left sides – getting you to lift both your emotional and physical energies. By their very nature SMART goals have a deadline. There is a point to which you either achieve them (big TICK, yay you) or you don’t (cue sense of failure). When life throws the inevitable curve ball or two, goals struggle to respond well, which can not only affect the outcome of the specific goal but also the bigger plan that it is part of. Not achieving a goal is bad enough, but repeatedly struggling to achieve a goal can leave you not only failing, but also feeling like a failure. However, say you don’t struggle and you do achieve your goal. After you’ve crossed it off your list, given yourself a “high-five” or performed your personal happy dance what then? Onto the next? Here’s a question for you ponder – when do you want to stop being the best, most awesomely healthy, productive, successful (insert your own adjective) version of yourself? NEVER! You don’t want to ever stop being and feeling that incredible. Intentions live on – sure they evolve, but it’s not about doing, achieving, moving on. 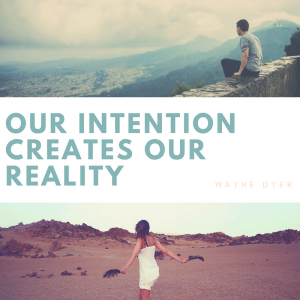 When you work with intentions you allow yourself to approach change from a more expansive, energy-centred, behaviour-driven perspective. I intend for my mind to be receptive to clarity, inspiration, and any information that will guide me toward my business objectives. Remember how intentions are broad and holistic – they cover emotion and feelings and senses too – they paint a picture with moving technicolour images. Unlike goals they allow you to think beyond a specific timeframe and they are equally balanced between now and the future. Just think about that for a second. Intentions hold you accountable to your values, keep you grounded and present in the now. The magic is that at the same time they propel you towards a brighter future place where you will also be present and rooted to your inner drivers. That then becomes a positive or virtuous feedback cycle, that virtually sustains itself. Wow! Intentions are all encompassing enough to get you focused on the whole person you want to be – for yourself and for others. So how are you going to channel your unique gifts, that the world needs to experience and benefit from? I intend to show acts of kindness today, opening myself to any possibility to bring joy into the life of others. How often do you set a goal to improve something simply because you feel crap right now? Wanting to lose a few kilo’s is a classic example of this. But how many times have you tried to do that and failed? Trying to take action because you wish that you felt better is somehow veiled in negativity. Instead of focusing on the discomfort, problems with your current situation or the perceived limitations of your life right now, intentions focus on the positive. It’s almost a verbal contract with yourself stating how you choose to feel, intend to act, receive and behave. Energetically speaking, this is incredibly powerful. I intend to live in gratitude for all that I have and all that I am, allowing joy and love to fill my heart and positive energy to fill my body. When you’re working with a goal-orientated mindset you can become somewhat myopic. There’s this thing that you’re so desperately trying to achieve, with this looming deadline that you can miss so much of the amazingness that is going on right under your nose. Intentions get you to look outwards and upwards. Alone, that is quite beautiful, however this change of focus has a couple of additional benefits. Firstly by looking outwards we are naturally less ‘self’ oriented. We are then in a position to consider others, to approach life more altruistically. I don’t believe I am being naive in this endeavour. Secondly this enables us to consider a more global perspective. 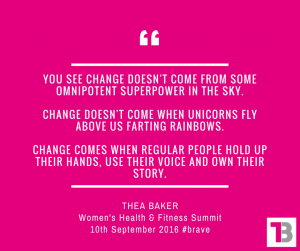 As I said at the Women’s Health & Fitness Summit last year in this presentation, big picture change comes when as individual’s, we own our story and act. Shifting the focus outwards can only encourage and support this. I intend to remain open and receptive to opportunities for meaningful contribution to women’s health and wellbeing, and I am grateful for any part that I play in facilitating change, however small that may be. Intentions area part of the mindset work, part of the foundations, before the work really starts to happen. There are no rainbow-farting unicorns here. And whilst you might argue that this is a whole lot of yogi-inspired nonsense I would challenge you to give it a go. In my coaching experience when you remove the pressure around goal setting, moving towards the practice of intentions there is a palpable change of perspective and of energy. Regardless, action is still needed. We can’t just sit around like Buddha waiting for the universe to deliver. The next part of the coaching journey is where we start to look at how to create that positive momentum.